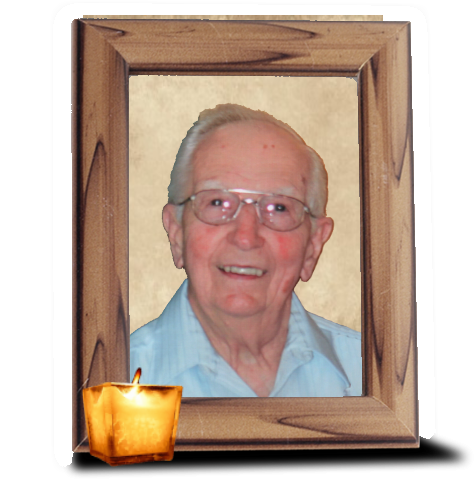 Obituary for Elmer F. Charles | Wiesner & Massart, Inc.
Elmer Charles, 96, of Algoma, WI, passed away on November 19, 2018. Elmer was born August 6, 1922 to the late Frank and Louise (Barrett) Charles. He married Bertha (Betty) Seestadt in Maplewood on July 20, 1948. She preceded him in death on July 30th, 1996. Elmer farmed with his parents and brother Francis until his marriage to Betty, when they bought their own farm in Kewaunee County. He also worked at the shipyards and retired from Kewaunee Fabrication formerly Engineering in 1985. He then worked 14 years for the Aging Resource Center in Kewaunee as a bus driver and volunteer for Meals on Wheels. He retired from this job in 2002 because of his bad back. He enjoyed traveling with his wife and family whenever he found time. He also enjoyed hunting with his sons and playing sheepshead. Elmer is survived by his sons, Robert “Bob” (Darlene) Charles, Abrams, WI, and Blane (Mary) Charles, Wesby, WI. Eight grandchildren and six great-grandchildren. He was preceded in death by his wife Betty; daughter Bonnie; one great-grandchild; brother, Francis; and his half-sister, Laura; as well as by nieces and nephews. Visitation will be held Saturday, November 24, 2018 from 10-11:30 am at St. Hubert Catholic Church in Rosiere. Mass of Christian Burial will take place at 11:30 am with Fr. Edward Looney and Fr. Dennis Drury concelebrating. Burial will follow in the church cemetery. Wiesner & Massart Funeral Homes is assisting the family with arrangements. Online condolence messages may be shared at www.wiesnermassart.com .